The Afsluitdijk (English: Enclosure Dam) is a major causeway in the Netherlands, constructed between 1927 and 1932 and running from Den Oever on Wieringen in North Holland province, to the village of Zurich in Friesland province, over a length of 32 kilometres (20 mi) and a width of 90 metres (300 ft), at an initial height of 7.25 metres (23.8 ft) above sea level. It is a fundamental part of the larger Zuiderzee Works, damming off the Zuiderzee, a salt water inlet of the North Sea, and turning it into the fresh water lake of the IJsselmeer. The Afsluitdijkwas the initial demonstration site for a 130 km/h (81 mph) speed limit in the Netherlands. 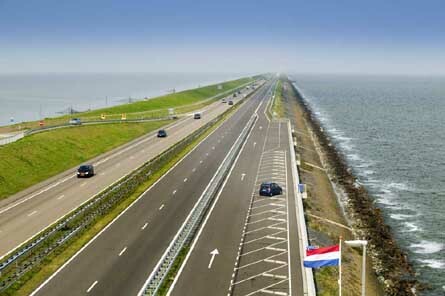 Wieringen was connected to the mainland with the short Amsteldiepdijk in 1925; the AFsluitdijk would be 20 miles (32 km) in length. The inland side is heavy stone; the seaward side is boulder clay with brushwood mattresses above, weighed down by boulders and old concrete. Previous experience had showed that boulder clay was superior to just sand or clay for a structure like the Afsluitdijk, with the added benefit that till was in plentiful supply in the area; it could be retrieved in large quantities by simply dredging it from the bottom of the Zuiderzee. Work started at four points: on both sides of the mainland and on two specially made construction-islands (Kornwerderzand and Breezanddijk) along the line of the future dike. From these points, the dike slowly grew by ships depositing till into the open sea until it breached the surface. The nascent dike was then strengthened from land by basalt rocks and mats of willow switch at its base. The dike could then be finished off by raising it further with sand and finally clay for the surface of the dike, on which grass was planted. As the dike grew, physicist Hendrik Antoon Lorentz calculated the force of the tide as the smaller gap made it stronger. Ten thousand workers, 27 large dredges, 13 floating cranes, 132 barges, and 88 tugs worked on the project at the end, timed to close the dike at low tide; it was finished on 28 May 1932. Construction progressed better than expected; at three points along the line of the dike there were deeper underwater trenches where the tidal current was much stronger than elsewhere. These had been considered to be major obstacles to completing the dike, but all of them proved to be relatively straightforward. Two years earlier than initially thought, the Zuiderzee ceased to be, as the last tidal trench, the Vlieter, was closed by a final bucket of till. The IJsselmeer was born, even though it was still salty at the time. The dike itself however was not finished yet as it still needed to be brought up to its required height and a road linking Friesland and North Holland (the current A7/E22 motorway) also remained to be built. On 25 September 1933, the Afsluitdijk was officially opened, with a monument designed by architect Dudok marking the spot where the dike had been closed. The amount of material used is estimated at 23 million cubic metres (810 million cu ft) of sand and 13.5 million cubic metres (480 million cu ft) of till and over the years an average of around four to five thousand workers were involved with the construction every day, relieving some of the unemployment following the Great Depression. Beside the dike itself, there was also the necessary construction of two complexes of shipping locks and discharge sluices at both ends of the dike. The complex at Den Oever includes the Stevin lock (named after Hendrik Stevin, a son of mathematician and engineer Simon Stevin) and three series of five sluices for discharging the IJsselmeer into the Wadden Sea; the other complex at Kornwerderzand is composed of the Lorentz locks (named after the physicist) and two series of five sluices, making a total of 25 discharge sluices. It is necessary to routinely discharge water from the lake since it is continually fed by rivers and streams (most notably the IJssel river that gives its name to the lake) and polders draining their water into the IJsselmeer. This entry was posted in Documentation and tagged Enclosure dam. Bookmark the permalink.